Chattahoochee River Cleanup for April 8th. NEED Volunteers! We will be partnering with Chattahoochee Riverkeepers and Hardman Farm Historic Site to do a river clean-up of the Chattahoochee. 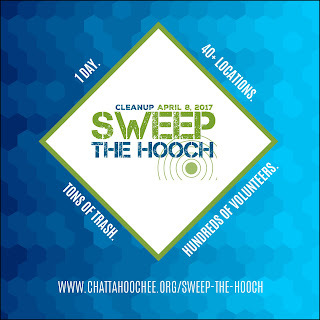 We invite you to keep our rivers clean and beautiful by picking up trash along the Chattahoochee. We will meet at Hardman Farm parking lot. Please wear clothes that you do not mind getting dirty. Trash bags will be provided. Meet at Hardman Farm parking lot. You will need to register at the website listed in the graphic below and if you do register before the date you will get a free t shirt! (good incentive) We will provide supplies like trash bags and extra gloves but you do need to dress to get wet and dirty. Hey, know About Laura Haddock biography? Visit Our page or Secrets Of Laura Haddock! Do You Know? Photos from the "Hoot on the Hooch"
Quilt winner at the "Hoot"